Hmmmm, I'm not sure what to make of that. A two-part story The Hungry Earth-Cold Blood sees the return of Homo Reptilia aka The Eocenes aka The Silurians. Unfortunately, they've had a makeover, which makes them seem less 'alien' and more 'Star Trek: Next Generation'. It's a lovely make-up job, it really is but it is less interesting than the originals. So, there's an initial quibble for you. I'm sure it's also film in the same place as Torchwood: Countryside, although that might be my imagination because it has a little of the same vibe and it is written by the same writer Chris Chibnall. Perhaps it's the Welsh-ness of it. Also, I found the second episode awful in comparison with the first. What's the point in giving yourself two episodes if you're going to rush together the end of the story with a whoosh of convenience and farewells. Ah, but we have the season long arc to finish so we must spend a chunk of the episode pushing that along and killing Rory, for the first time. And removing him from existence. It's all rather rushed and despite Karen Gillen giving it her best Rory's death just didn't have the impact it should have done. Perhaps though I am spoiled by knowing how it will all pan out in the end. Perhaps that has cooled the reaction. Perhaps but I suspect not. It's all so rushed and then we must push it along a little more to sow another seed for the 'crack' arc. This is the problem with season long story arcs. If clumsily handled they get in the way of the story you are in and I think - in this case - that's what happens. Alaya and Restac are both played by Neve McIntosh who has since gone on to be the Homo Reptilia of choice as Madame Vastra. Both her characters in this are of a nastier, more murderous inclination. They don't like apes and they want their planet back. They're not afraid to bump off members of their own race to do it. Or die. The end justifies the means. Being a ‘Silurian’ story, we get echoes of previous stories and a wiser, more peaceful Elder Eldane (Stephen Moore) is the other side of the Silurian character. He's looking for a peaceful solution to the problem. It's is Eldane's reaction to Alaya's death that convinces you that this will not end well. 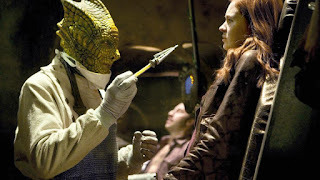 But in the end - and without much in the way of explanation as to why - Eldane trusts the humans and the Doctor enough to force his people back into suspended animation. Woo-hoo. The guest cast is small and initially the two-part story looks like it is going to give us room for character development but then whoosh it rushes away with itself so Meera Syal's Nasreen Chaudhrey realises that she loves Robert Pugh's (who I love btw - brilliant actor) Tony Mack but the whole thing seems as rushed in the end as Leela's departure in The Invasion of Time. Oh but a big round of applause to Samuel Davies as Elliot for being a child actor in Doctor Who that isn't actually really annoying. To cut this ramble short there's a good story in here somewhere with good characters but it doesn't quite escape from being squeezed by the need to fit a story arc. A decent-ish first episode is hamstrung by a rushed and disappointing second. Not horrible. Just eminently forgettable. Oh and oh. Er, if this drill, having reached the furthest into the Earth ever, then why isn't the planet screaming out its rage? Has nobody heard of Inferno? *I knew what I meant by this when I typed it. I may have lost it afterwards, but these are meant to be stream of consciousness, immediate reaction articles so...and I still think I know. Sort of. Ish.